In the crowded breakfast foods industry, companies are constantly scrambling to find exciting and innovative ways to attract consumers to their products. This is especially true for food giant General Mills, which just announced a bold new strategy to help boost the market share of one of its most iconic brands. In the coming weeks, the breakfast cereal Golden Grahams will be completely rebranded as a cereal exclusively for people who are grieving. Recognizing the untapped market potential of the millions of Americans who lose loved ones every single year, Golden Grahams is going all-in with an aggressive new marketing campaign that repaints the cereal as a source of whole-grain goodness for consumers in the throes of grief. A new commercial for the cereal strikes Golden Grahams’ solemn new tone. In it, a woman sits anxiously in a hospital waiting room while her father undergoes a high-risk craniotomy for a ruptured blood vessel in his brain. Suddenly, the brain surgeon walks out of the operating room with a somber look on his face carrying a bowl of Golden Grahams. 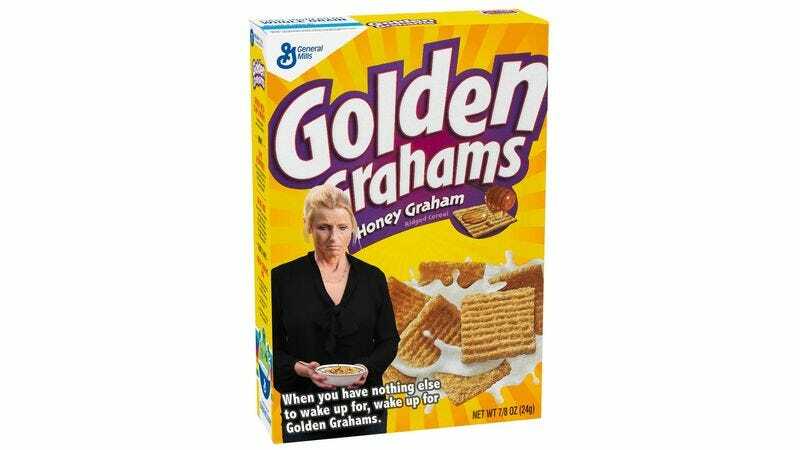 The woman sees the Golden Grahams and immediately bursts into tears. “Your father is at peace now,” the surgeon says. “And the best way for you to be at peace with his passing is with the great taste of Golden Grahams—now with no artificial coloring or flavors.” A cautiously optimistic smile then spreads across the woman’s face as she begins to eat the cereal. Wow. Whether or not the company succeeds in making its product synonymous with grief, this new direction for Golden Grahams signals a major shake-up in the breakfast foods industry. Don’t be surprised if other breakfast cereals soon follow suit.